Isla Elizabeth Morton died on Monday January 28, 2019, at her home in Casper. She was 91. 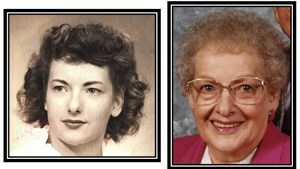 She was born April 12th, 1927 in Hartland, Maine, the daughter of Edwin and Bertha (Linn) Joy. Isla graduated from Lewiston High School in Lewiston, ME, in 1945. She served as a volunteer aircraft spotter for the US Army Air Force, Aircraft Warning Service, from 1943-44. In April of 1945 she met Gerald Morton, a young sailor stationed at the Sanford Maine Naval Station. Isla and Gerald were married in October 1945, and Isla committed her young adult life to supporting her husband and raising their four children, first in the northwest Kansas town of Palco, and then in Cheyenne, Wyoming. As a housewife, she supplemented the family income by ironing clothes for friends and neighbors. She always took great interest in the education and extracurricular activities of her children and continued to fully support them throughout their adult lives as they pursued their own careers and raised families of their own. As the children entered high school, and beyond, Isla was able to focus on achieving some of her own personal goals, which included obtaining a driver's license and driving a car for the first time, at age 40. Isla enrolled in the secretarial science program at Laramie County Community College, and later at Casper College, where she was awarded her A.A.S/ in 1984. Isla began her secretarial career with the National Cylinder Gas Company in Cheyenne. After she and Gerald moved to Casper in 1973, she was employed at Casper College with the Truck Driving and Nursing programs, retiring from CC in 1990. For a time, Isla was a member of the Masonic-affiliated Order of the Eastern Star and spent many years traveling with her husband as he participated in numerous parades and events as part of the Shrine Korein T-Patrol, bringing awareness and raising funds to support Shriner Hospitals for Children. Isla and Gerald also enjoyed giving rides to friends and family on their pontoon boat at Alcova Reservoir. For a time they also participated in a time-share condominium in Jackson, WY. They spent many mornings walking the River Trail and inside the Eastridge Mall for exercise. Isla was a member of the Natrona County Thrifty Ann Homemaker's Club. She hosted an annual "Parade Day" sloppy joe lunch each July and took turns hosting luncheons with her good friends from her Casper College Days: Joan Frederiksen, Norma Bay, Bev Loftin, Georgia Ritzman, Katy Noah, Jackie Wicker, Betsey Lewis, and Jean Wheatley. She was preceded in death by her mother, Bertha A. (Linn) Joy, father Edwin J. Joy, brothers Linn E. and John F. Joy, daughter Sheila M. Gafford, and daughter-in-law Norma E. Morton. Survivors include her husband, Gerald, sons Garry and Tony Morton, daughter Joy (Brad) Grapes, son-in-law, Tom Gafford; eight grandchildren, including Tammy Gafford, Michele (Gregory) Gautreau, Brian (Karen) Gafford, Belinda (Allen) Brown, Laura Morton, Tim (Shelley) Morton, Elizabeth (Abe) Correa, and Toby (Jackie) Grapes; 20 great grandchildren; 1 great-great-grandchild; and numerous nieces, nephews, and their families. Memorial donations to the Casper Shrine Hospital Fund would be appreciated. To share your memories of Isla or leave a special condolence message for her family, please click the Share Memories button above. Add your memories to the guest book of Isla Morton. This is Leah Noakes from Cahill Circle. Do you remember playing with all us little Noakes kids in our yard? Have you kept track of Steve Harvey? We all had such fun together! Some of my fun, cherished childhood memories were created by you and Joy and Steve! All of us little Noakes kids are grown up and have become doting grandparents. We're scattered all over the western states. I live in Idaho. Jeannie's in Oregon. Kay changed her name to Kady. She lives in Washington state. Carol is in Utah as is our older sister, Ellen. Steve is in Wyoming & Arizona (snowbird). Charlie just moved to Arizona. Gail was just a baby when we lived in Cheyenne. She also lives in Arizona. Our Dad passed away in 1991 and our Mom joined him in 1998. I'm sorry to hear about the passing of your mother. She was quite an accomplished person, wasn't she?! So grateful to catch up to you and hope to hear about you and all of your adventures since we moved to Alaska 52 years ago!!! MOM WAS A CLASSY LADY. EVERYONE LOVED HER. SHE GAVE ME THE MOST WONDERFUL GIFT SHE COULD POSSIBLY GIVE , (HER DAUGHTER), WE WILL ALL MISS HER.SHE LOVED THE COLOR HOT PINK. SORRY I DIDN'T VISIT YOU MORE. I LOVED HER.GOOD BYE MOM. Mom, I loved you and missed you. You gave me the most wonderful thing that you could give, your daughter. She was your gift for fifty one years.Thank you. Oh, Aunt Isla, you will be missed. You have always been in my life--I can't remember a time without you in it. Growing up, I remember the phone calls you and Dad (Linn E. Joy, brother) made to each other, the letters back and forth in a time way before cell phones or email. The sweet times we spent in Maine, or N.C. All of you three siblings are gone now: Linn, Isla, John. I like to think you'll be watching after us with Sheila. What a loving, big heart you had for all of us! It continues on in all those you love....love never dies. You leave us with sweet memories--thank you for the gifts you brought all of us.